Whether you are a beginner, amateur, or expert birder, or just enjoy bird watching in your back yard, RareBirder is the app you need. RareBirder is Powered By eBird. 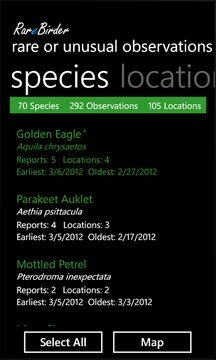 All over the globe, tens of thousands of birders acting as citizen scientists submit millions of bird observations every month to Cornell University’s eBird database. These observations are then reviewed by local birding experts for accuracy to ensure the validity of each sighting. 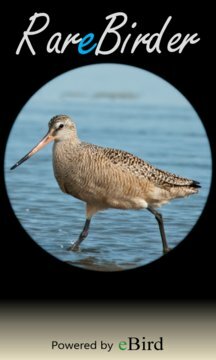 RareBirder is powered by this database to give you an accurate and comprehensive listing of recent rare or unusual bird sightings for anywhere in the world where eBirders have submitted observations. What this means is that if you live in an area where there are lots of eBirders, then RareBirder will show you rare bird observations frequently. Conversely, if you live in an area where there are few eBirders, then you will see rare bird observations less often. Try it for free and purchase it now price of $5.99 - a 40% savings! In Trial Mode, several features are disabled including getting directions on the map, changing observation settings, and you can not add new locations. Purchasing the app removes these restrictions. A Windows Store version of this app is also available.